The Sketches of Rich Ellis | Weekly Sketchblog Happiness. I think its time for a bit of an update. For Starters, my very first work for Marvel Comics has just come out today! I worked on a 4 page flashback sequence in the Marvel Adventures Giant Size Fantastic 4 #1! The book was written by Paul Tobin and contains not only a complete 22 page story, but also 2 back up stories drawn by none other than the likes of Mrs. Colleen Coover and Mr. Dustin Weaver! Everyone everywhere should check it out! For Enders, I’ve been working on a new website to combine this tasty blog with my portfolio site and I should be up with it some time next week. Since saturday is Valentine’s day I thought it would be a good time for some cheesecake! Hope you guys aren’t on a diet. Have a good weekend everyone! Here’s Johnny ! This week, as you can see I’ve drawn everyone’s favorite hothead. I had fun toying around with this one. I hope you all enjoy it as well. See ya next Friday Everybody! Oh… My… God… It’s an actual SKETCH!!! That’s right, this week I decided to stop myself at a point where a normal person might loosely be able to call this a sketch. (*Guilty Pause*) Ok fine, it’s finished pencils for an illustration. I’ve had multiple comments from my friends at the studio about the subjective “sketchiness” of the illustrations I often do for the blog. *Cough* *Cough* Colleen Coover * Cough* * Cough* My philosophy when starting this blog was mostly that these were to be illustrations or drawings I do for myself or about projects and things I enjoy. If I often go overboard, it is out of pure enjoyment. P.S. If you would like to check out more illustrations and character drawings from that game you can check out THIS BLOG. The upshot to gaming with a bunch of cartoonists is that you get some nice Geeky fan art. Tags: Aiden Harlock, D&D, Swamp, Swords, The Ladies! This week I decided to switch up my method a bit and do a watercolor illustration. The subject matter came from The Terry Pratchett novels having to do with the Ankh-Morpork City Watch. Specifically I’m giving you my mental images of Captain Carrot Ironfoundersson, and Sergeant Delphine Angua von Uberwald. Like a lot of cartoonists I know, I am constantly listening to books on tape while I work. More often than not lately, it’s been a Discworld novel I’m listening to. I really enjoy Pratchett’s sense of satire and following the progression of his characters. I can’t readily think of any other writer who could handle literally an entire universe full of characters with interdependent story-lines without having it all go completely wahoony shaped. This week I’ve done an illustration inspired by the soon to be released series DOCTOR DOOM AND THE MASTERS OF EVIL! It’s being written by Paul Tobin (Writer of a multitude awesome books at Marvel right now! ), and from what I’ve heard from him this book sounds amazing! Who doesn’t like the anti hero story? In any case I had a lot of fun with this one and I can’t wait to read this book. Ps. 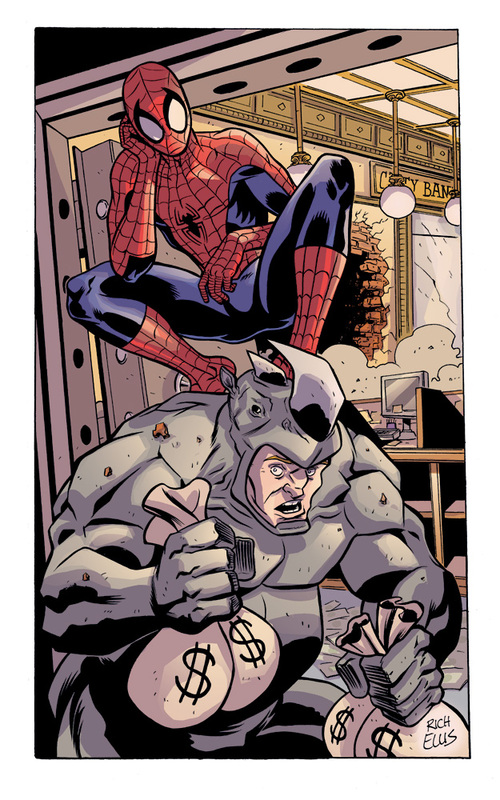 I had a lot of fun drawing the Sinister Six’s Swinging Bachalor pad. This week I decided I needed to finally do an Agents of Atlas Illustration! I’ve been meaning to do a sketch based on this book for a while. I thought that the news about the soon to be released second story line was as good a reason as any. Like the previous book it will be written by none other than my fellow studio-mate Jeff Parker . If you haven’t had a chance to read the original story arc for Agents I highly recommend looking for the hard cover. Tags: Comics, Festive, Holidays, Raven's Gambit, Santa, The Ladies! 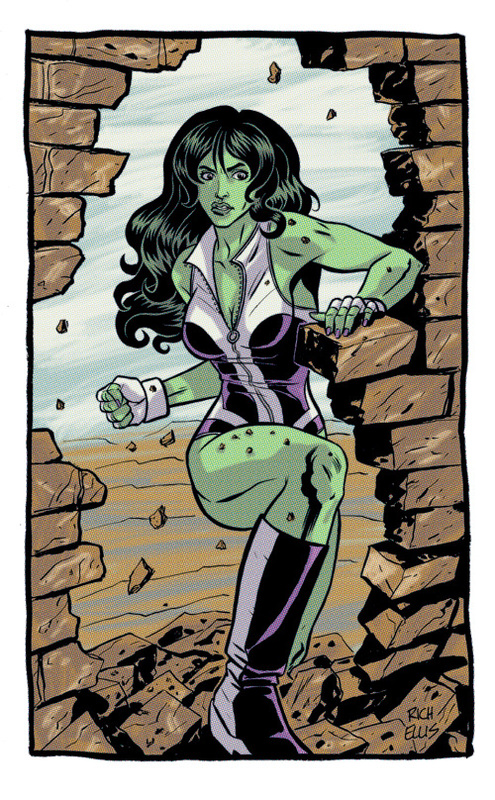 This week by popular demand I am giving you The Sensational SHE-HULK! I’m also posting it a little early because I am going on a family trip with my wife and company tomorrow and I will be gone on Friday. I’m off to enjoy the rain filled fun to be had at the Oregon beach. I hope you enjoy the sketch. Tags: Brick Wall, Comics, Marvel, She-Hulk, The Ladies! When will the Rhino Ever learn…Seriously. I finished the first draft coloring on my graphic novel this week so I had a bit more time with this one. I hope you all enjoy it.